It's preliminary finals time as we move into the second last week of AFL footy finals and just four teams still manage to hang in the competition. With GWS taking on Richmond and the Crows to take on Geelong this weekend, Bryce Viskovich and Rhys Daws from Perth Beer Snobs are back once again to bring local footy fans their perfect beer and snack pairings for each game. With all four top teams from the home and away season battling it out, this should make for some cracking football! The Tigers find themselves in some uncharted territory as the last time Richmond played in a Preliminary final is way back in 2001 in a belting at the Gabba, losing by 68 points to the Brisbane Lions. The Richmond faithful will be out in record numbers once again this Saturday and if there's a repeat of form from two weeks ago, the boys in black and yellow may very well find themselves at the G once again for the last weekend in September. The Giants were well and truly up and about last weekend and that second half onslaught led by veteran superstar Stevie Johnson was a showing of form far too classy for the travel-fatigued Eagles. If the Giants keep that class and speedy ball movement going we are going to have a spectacular game on our hands! Live on Free-to-air and Fox Footy from 2.30pm. 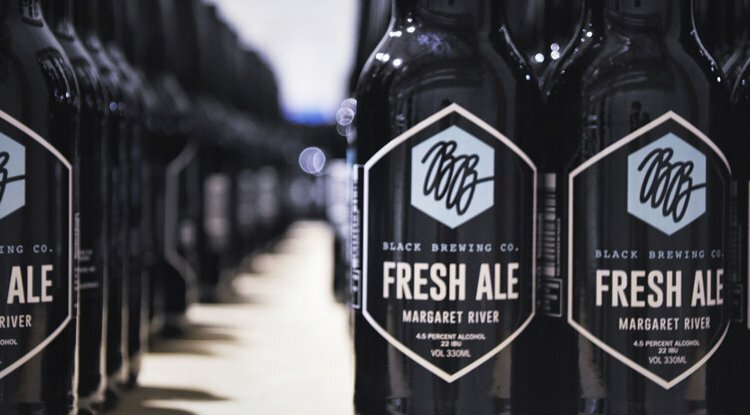 The Brewery: Black Brewing Co.
Black brewing Co. is located within the walls of the old Duckstein brewery in Margaret River overlooking that fantastic man-made lake many a sunset selfie has been taken upon. The brewery's concept came about when friends and business partners Stewart Sampson and Scott Douglas took over the land and the buildings, creating the ever-evolving Black Brewing Co. which includes a brewery, winery, Vintner Black and the distillery (turning out a top class gin). BB is currently producing six beer varieties ranging from a Japanese style rice lager to a delightful session milk stout and few familiar styles in between. Our Pick: Fresh Ale, 4.5% ABV. Well, the name says it all with this beer's crisp finish and perfect balancing creating a very approachable taste followed by a unquenchable desire for more. From the moment this beer's foam touches your mouth the light malts and Aussie hops deliver subtle malty sweetness and citrus with melon and grapefruit aromas that finish dry on the palate to keep you coming back again and again. Serve BB's Fresh Ale in a tulip glass to really appreciate the melon and grapefruit nose. This is a super-easy, ultra-tasty marinade that'll have your prawns singing on the barbie plate but just wait for the chorus line when they're paired with a BB Fresh Ale and the flavour of the prawns is able to shine. Add prawns and toss to coat. Marinate in the fridge for 30 mins. Preheat oiled BBQ to high. Thread prawns onto bamboo skewers, piercing once near the tail and once near the head. Discard the remaining marinade and don't overload the skewers. Cook for 2 to 3 minutes per side or just until opaque. Serve immediately with a freshly cracked Fresh Ale. The Cats and the Crows square off for a spot in the grand final this Friday as the Queen's Birthday long weekend kicks into gear. Adelaide has had a whopping 15 days to prepare for this game while Geelong is going off pure momentum, coming off a very impressive 59 point thumping of the red-hot Sydney Swans. Coming off a hugely impressive game last Friday, the Cat's star Patrick Dangerfield will play in front of an intimidating Adelaide home crowd in what is sure to be an unforgettable finals atmosphere. As these are two of the highest scoring teams this season, settle in for a good old fashioned shootout. This will be a big night of footy and it will be very interesting to see which team comes out on top. Pro-Tip: We recommend taking the Cats as underdogs in this matchup for all the punters out there this weekend. At $2.95 on Ladbrokes, we will definitely be dropping a punt on Geelong because it's finals and at this stage in the competition, anything can happen. Located in the Swan Valley, very much the heart of our local craft beer scene, Mash brewery has been a part of Perth’s growing beer movement since 2006. More recently, since a new brewery team was brought in 2011, they’ve been one of the state's most awarded breweries. Mash's range covers various different styles of ales including an English IPA, an American IPA (their most popular beer), a Belgian abbey ale, a pale ale, and highly sessionable Indian ale. There is also a very West Aussie style lager and Mash's own cider (if you like that kinda thing...). Our Pick: Indian Session Ale, 4.4% abv. Brewed for the legendary WA summer, using a combination of Galaxy, Citra and Mosiac hops balanced out with some sweeter malts work together to make Indian Session Ale a low bitterness, highly drinkable beer for warmer nights and in this case - heated, fast-paced AFL finals. An easy, light and quick-to-prepare snack. All that's required is a few fresh boneless fillets of white fish, pan fried, along with some mini flour tortillas, 1 or 2 tomatoes as required, a bunch of fresh coriander and a lime. Australian pale ales and lighter Indian ales in this style are perfectly complemented by seafood with lemon or lime. This enhances the sweet and tropical aroma and taste of the beer (revisit this in the middle of summer, trust me). 1. Wash and dice up the fresh coriander leaves. 2. Wash and chop the tomato into small cubes, place on a few paper towels and sop up the moisture with another paper towel. 3. Pan fry the fish fillets, as required, chop up into small cubes as necessary. 4. Place a tablespoon of chopped fish on each fajita, then a tablespoon of the cubed tomatoes, a pinch of freshly diced coriander and squeeze some lime juice over the top (and as an extra maybe add some guacamole). 5. Serve the fish piping hot with a bowl of fresh guacamole and a frosty Indian Session Ale.